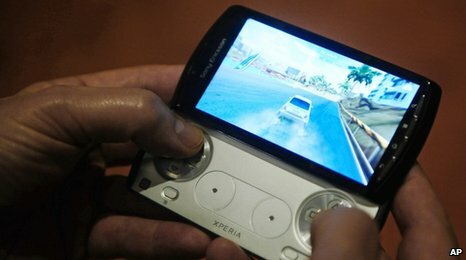 The so-called "PlayStation" phone has been officially launched by Sony Ericsson. The Xperia Play is the first android smartphone with support for PlayStation games but faces tough competition from other phones and portable consoles including Sony's own NGP. The device has been unveiled in Barcelona ahead of a mobile trade show in the Spanish city this week. It's expected to go on sale in the UK in April. It will be available on T-Mobile, Orange, Vodafone and O2. The phone features a 4-inch touch screen and 5-megapixel camera but the main attraction will be the slide-out control pad with similar buttons to a PlayStation controller. It will be the first phone to let users download games from the PlayStation Suite. Titles like Assassin's Creed, FIFA 10 and Need for Speed have already been announced. Other phones will be able to support the PlayStation Suite when it is launched later this year. Sony Ericsson has yet to say how much the Xperia Play will cost, or the price of downloading games. Critics say good games are already available on hundreds of other smartphones and lots are free to download. Sony Ericsson is hoping to win some of the smartphone market dominated by firms like Apple, Blackberry, HTC and Samsung. Most of these phone makers are launching new products at the Mobile World Congress in Barcelona.